The E1B is a flashlight designed to be used as a backup light for law enforcement and related jobs. The light features a Cree LED with TIR optics and two levels of output using a single C123 battery. The switch of the E1B is new for Surefire lights, it is a clickie switch that goes to high mode with the first click and to low mode with a second one. A light press of the switch without clicking from off gives you momentary maximum mode. This is probably intended to provide maximum light quickly in case of need but it is certainly a problem if you just need low light and want to preserve night vision. The light runs for about 1.3 hours in maximum mode providing about 80 lumen of light in low mode it will last for about 35 hours at 5 lumen which is good enough for reading and general navigation. The pocket clip is bidirectional meaning that you can clip the light bezel up or bezel down depending on your preferences the body in anodized aluminum type III is very strong but has been streamlined so it won't be agressive with pockets or clothing this is a good detail if the idea is to keep the light clipped for very long times and use it in case of need. The clip is also very strong and unless something terrible happens the light won't be lost. This is not the brightest Cree light in the market and it is not the most functional light either but as a general purpose light or a backup light it is a very good option and its certainly brighter in high mode than many single cell lighs out there. You can get it for $110 from BatteryJunction. I love this light, I have a few Surefire's, But ebay they go, This light does it all, It is small, VERY POWERFUL, 80 lumens sounds like alot, But when you turn it on,, it's twice what I expected, I don't like led, but this is so bright and smooth I love it, And It runs on 1 cr123 or cr123a battery, And that seams to last forever, It has 2 settings and even the low setting is plenty of light and that last like 37 hours, Good for everything from reading a map to lighting up the tent for camping, You can get such a great deal on batteries on ebay now that it does not kill you to turn one on and leave it on like it use to. I bought one and I like it so much I bought another for my wifes up coming Birthday, We have 2 acres and she is always heading out to check her horses, This is a perfect gift. Expensive,,,Yes, But using only 1 battery and lasting as long as it does, It' worth it, Just don't lose it. While I don't own any Surefire lights, I can say with confidence that this particular light is way over-hyped. There are other single-cell lights out there that are much brighter and cost nearly half of what this one does. Take the Jetbeam Jet-1 Pro v3.0, for instance. 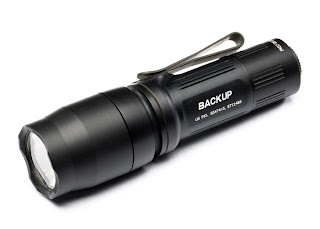 It costs around $70, and gets 140 lumens from a normal AA battery, or 240 from a 14500 Li-ion. It also weighs less (1.75 oz Vs. 2.8 oz.) and is the same length as the Surefire. Fenix also has some awesome lights that are vastly cheaper and outperform the E1B. Just my $.02. There may be cheaper lights out there, but when your life depends on it, the surefire is the only light reliable enough for that.